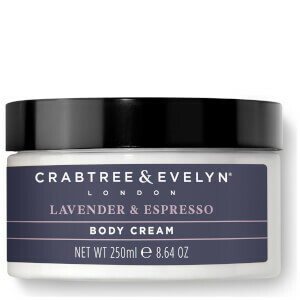 Restore dry skin with the Crabtree & Evelyn Lavender Body Cream; a velvet-soft treatment brimming with a host of natural emollients and nourishing extracts. Based upon a Shea Butter and Olive Oil formula, it rapidly absorbs into skin to deliver intensive conditioning, promoting a smooth and supple surface texture. An aromatic blend of woody Lavender, spicy Patchouli and rich Espresso creates a lingering scent to calm and uplift the senses. Apply generously on extremely dry patches for targeted results.